The Piper PA-22-108 Colt is a single engine, two-seat high-wing light utility aircraft. The Piper PA-22-108 Colt has a fabric-covered all-metal airfrane and is powered by a 108 h.p. Lycoming O-235-C1B four-cilinder air-cooled engine. The Piper PA-22-108 Colt variant of the Piper PA-22 was not really planned, but in the early 1960s the Piper PA-28 Cherokee was falling behind in production and Piper Aircraft Inc. needed an interim two-place training aircraft that could be assembled quickly and cheaply. This need created the Colt, which could be viewed as a flapless, two-seat version of the Tri-Pacer or a modernized, tricycle-gear Clipper. In addition to deleting the Tri-Pacer’s flaps, the Colt was produced sans rear windows, the second wing tank, and the rear door. Based on the original type certificate of the Model PA-22 approved on 20 September 1950, the revision on the type certificate for Model PA-22-108 was approved on 21 October 1960. The PA-22-108 Colt entered production in 1961 and bears a close resemblance to the earlier PA-22-160 Tri-Pacer and does employ many Tri-Pacer components, including the undercarriage, engine mounts, windshield, door, tail surfaces, struts, seats and instrument panel. The Colt was intended largely for club and school use. The Piper PA-22 Tri-Pacer itselfs was a further development of the Piper PA-20 Pacer and introduced in 1951. Next to the standard version of the Colt, the Custom and Super Custom versions were offered with more elaborate equipment than was featured by the Standard model. The Piper PA-22-108 Colt remained in production to 1964, with 1849 aircraft built. On 3 October 2014, the 1961-built Piper PA-22-108 Colt D-EDCE was seen at Flugplatz Leer-Papenburg in Germany. This early Piper PA-22-108 Colt was registered D-EDCE on 7 August 1961. In the past, Piper PA-22 Colt D-EDCE was used in Germany mainly as an aero club trainer. 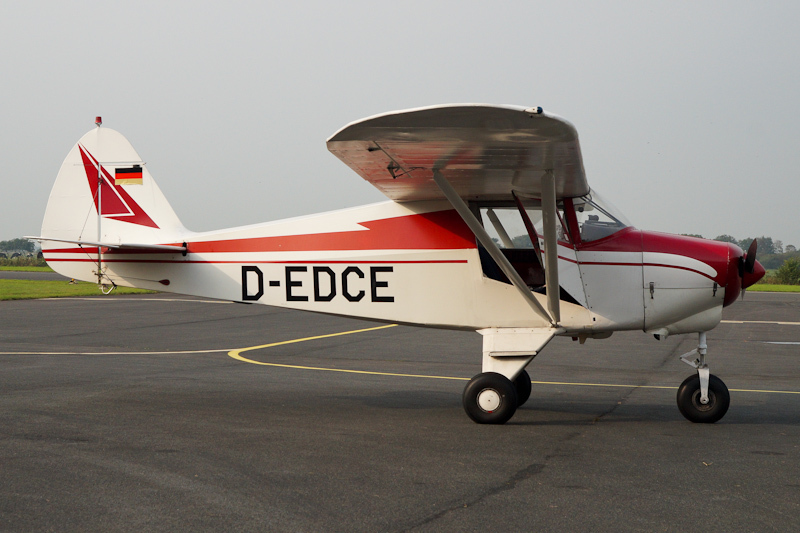 In the recent history of this aircraft, it was used in this role at Flugplatz Hamm-Lippewiesen.